Mar 22, 2014; Cleveland, OH, USA; Houston Rockets guard James Harden (13) drives to the basket through Cleveland Cavaliers guard Dion Waiters (3) and forward Alonzo Gee (33) during the third quarter at Quicken Loans Arena. Houston won 118-111. 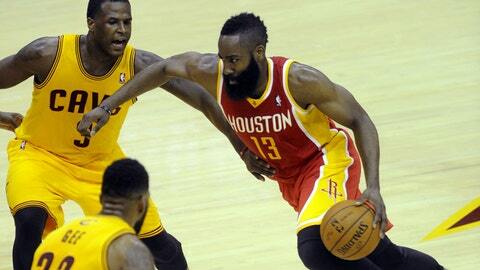 CLEVELAND (AP) — The Houston Rockets played again without Dwight Howard. Unfortunately for the Cleveland Cavaliers, James Harden was in the building. Harden scored 37 points, including 17 in the third quarter, and the Rockets led from wire-to-wire in a 118-111 victory on Saturday night. With Howard out for a third straight game because of a sore left ankle, Harden provided a boost. He was 9 of 15 from the field, hit five 3-pointers, made all 14 of his free throws and had 11 assists without playing the fourth quarter after Houston built a 29-point lead late in the third. "Great players do that, they get going," Rockets coach Kevin McHale said. "I’ve seen James do it countless times, but that’s what separates him from a lot of players. He has the ability to do that." Harden dominated in just about every aspect of the game. He drove to the basket, buried shots from well beyond the 3-point line, converted free throws and found open teammates. "I just tried to be aggressive and be in attack mode to get to the rim," he said. "If the drive is there, I take it. If it’s not, I’ll do something else. I just use my basketball instincts." Houston made its first four shots and took a quick lead in snapping a three-game road losing streak. The Rockets also strengthened their hold on the fourth spot in the Western Conference playoff race. "Obviously, Harden had a monster game," Brown said. "I don’t think he feels quite good enough to play, but he feels much better," McHale said before the game. Houston is undefeated in the eight-time All-Star’s absence. Howard scored 26 points and had six rebounds in the Rockets’ 106-92 win over Cleveland on Feb. 1. He averages 18.6 points and 12.4 rebounds for the season. Injuries and a brutal schedule have dropped Cleveland out of playoff contention. The Cavaliers are 2-8 in March and trail Atlanta by 6 1/2 games for the eighth spot in the Eastern Conference. Cleveland, which has also dropped games to the Los Angeles Clippers, Miami and Oklahoma City in the streak, has lost eight of 10 and has dropped five straight at home. The Cavaliers fell behind by 24 points in Thursday’s loss to the Thunder, a trend Brown is displeased with. "That’s two games in a row that we’ve come out and our first group has just been flat," he said. "They’ve been flat offensively, flat defensively. So it’s been an uphill battle, especially being short-handed."